How does becoming a monthly donor benefit me? Manitoba’s elite winter athletes are busy training and competing in the hopes of qualifying to represent Canada at the fast-approaching PyeongChang Olympics and Paralympics. While behind the scenes, CSCM “provide[s] essential support to coaches and athletes – we support them with our extensive knowledge and experience. Our work allows athletes to excel, and coaches to focus on the technical and tactical aspects of their sport.” – Kyle Turcotte, CSCM Strength & Conditioning Lead. 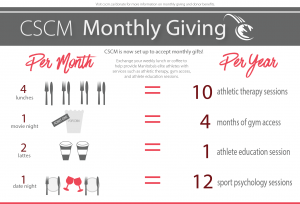 You can help CSCM help these athletes to excel now and in years to come through a one-time or monthly gift. Click here to learn more or to make a gift.